See Imam Achmed relating his own experiences of his fight against oppression, relating it to the current global socio-political climate,and showing us the way in which we must move forward. Hailing from South Africa, Imam Achmed Cassiem has been an inspiration to many South Africans for many years. From his incarceration in Robben Island alongside Nelson Mandela during Apartheid, to his arrest with 56 fellow worshippers for attending an ‘illegal’ prayer gathering on a friday, he has been an outspoken voice for change and justice. Furthermore, his academic credentials include a Hon. B.A. in Systematic Philosophy, as well as his authoring of many books on a range of topics from Theology to Humanology. 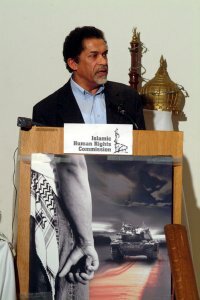 He has been and continues to be an advocate of human rights and equality including his founding of the International Union of NGO’s Defending the Rights of Palestinians in 2003. Please make every possible effort to come! !